We've been behind since pesach. We got slammed with yom tov expenses, and then next year's school registration. Not to mention the hefty sum spent on the midwife. We used our credit card, something long forbidden. We're still trying to pay that off. Amidst all this are my worried projections about the summer. I am sending my kids to camp, something I didn't do last year. Even Srulik will be going to a half-day program for 2-3 year olds. I told Yaakov that we had to do it - I'll be post-partum. But camp is costly, not to mention the expenses a new baby brings (Baruch Hashem). There's a story told by a guy in our neighborhood, who lost his business and his house. Every time someone asked him for tzedoka, he gave. When he didn't know how he could do it, he gave and gave and gave. He said when you feel like you have nothing to give, that's when you really have to! And he insisted Hashem always paid him back. With that in mind, I wrote two tzedoka checks this week. I didn't relinquish my worries, but I told Hashem I was giving in faith. I told Hashem I had faith He would continue to provide for us, and I hoped the tzedoka would help open that door wider. I told Hashem that even if I didn't see it in a revealed way, let the reward for the mitzvah be the mitzvah itself. There is a Ladino proverb; "Da al prove, y el Dio te pagara." - "Give to the poor, and G-d will repay you in kind." What isn't mentioned is; "El Dio paga interés, tambien." I've been thinking about shavuos, coming up this friday. Shavuos is when we received the Torah. What did the Hebrews say when asked if they would accept the Torah? "Na'aseh v'Nishmah." "We will do and we will listen." The doing part came before the understanding. "Okay Hashem, lay it on us. Whatever you give, we'll take it." Faith is not a rational thing. You know, when Avraham's sons were circumcised, Yishmael was 11 years old and Yitzchok was 8 days old. There's the argument: Isn't Yishmael's bris on a higher level than Yitzchok's? After all, Yishmael consciously chose to obey G-d, whereas Yitzchok had no choice in the matter. But it was Yitzchok, not Yishmael, who went on to father the Jewish people. What was it about Yitzchok's bris that was special? Yitzchok did not make a decision to be circumcised. It was beyond his reason. This is the nature of a Jew. I'm trying SO hard to prepare for this birth. I'm thinking good thoughts, repeating affirmations, reading "Spiritual Midwifery" for the gazillionth time. I've been so raw and emotional lately. Yesterday, I got in an argument with Yaakov. I threw my glasses at him and started to cry. In a grocery store parking lot. Last night my midwife showed me 2 natural childbirth videos. They made me want to have an epidural. Sometimes I have E.S.P. moments, if they could be called such. I'll envision something happening, and it does. Or I'll have a song in my head, and then hear it. Or I'll be thinking strongly of someone, and they'll call. The most intense experience I ever had was when I lived in the Brooklyn Ghetto. Unfortunately, certain people would send out "shmear letters." These would come in the mail, or be placed on our doorsteps. The sender would air out the dirty laundry going on within a Brooklyn Ghetto organization. Names would be named, fingers would be pointed. I was a part of this drama, because I would actually read them (instead of throwing them in the garbage where they belonged). Anyway, one time there was some nasty business going on in one of the Brooklyn Ghetto kashrus establishments. A certain person got really shmeared. Anyway, I was drifting off in my rocking chair, thinking of him. I thought, "He's probably a very nice guy. I mean, what if I was on the Avenue with my double stroller, and had a hard time getting into a store? He'd probably be a real mentsch and hold the door for me." You can guess what happened that week. And when it did, I freaked out - big time. I mean, is that weird or what? We saw a little video about it. We also got a workbook, through which I discovered I'm a "helicopter parent." I hover around my kids too much, trying to control the situation. This, in turn, dis-empowers them from making decisions (and ultimately learning). I'm trying to shut down my rotors and let L & L do the work! I really see an improvement in both my parenting my kids. It's a little challenging to integrate all this L & L stuff when we're due in about 3 weeks. I'm trying to prepare myself emotionally for the birth, I'm reading up a lot and learning new things. One thing I learned was that a laboring woman does not have to push so hard to get the baby out. Her womb alone will expel the infant (with 40 pounds of pressure per contraction!). If the woman bears down with the contraction, she adds another 20 pounds of pressure. The best thing is for the woman to push - because the need is very present - but gently so. "Breathe the baby out." It doesn't have to be an athletic event. This is major news to me, I wonder why I never learned this before! I think this will help a lot in my labor. 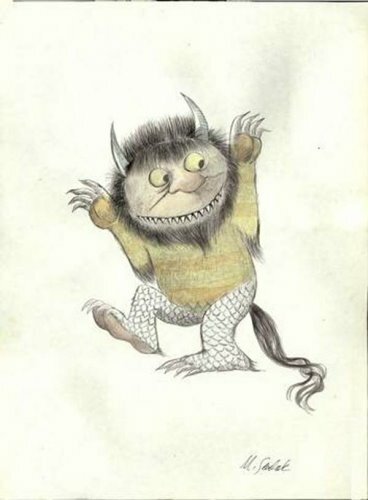 Today at the library, Miss Sondra read "Where the Wild Things Are" - a classic by Maurice Sendak. When I worked at the library in South Carolina, our children's room was painted with a "Wild Things" theme. Mr. Sendak came for its dedication. When he saw I was Jewish too, he told me the following: When he was a little boy, his relatives were coming from Eastern Europe to America. They were hairy and fleshy and bulbous, and to his little eyes, they looked like monsters. He fashioned the "Wild Things" after his memories of them. I'm a maven, not a shadchan. I read the New York Times' vows column. Also known as their "weddings and celebrations" feature. I like the lovey-dovey romance stories and reading about how people met. I like the 5 minute videos, where a couple tells their story. But what I can't stand, absolutely cannot stand, is when I think a couple is mismatched. Like, beautiful girl with ugly boy. Nope - I don't like it. Or M.D. marries sanitation worker. It happens. Or Sheila Bernstein marries Luke O'Hara. Diane Weiss - interfaith rabbi - officiates. That is the absolute worst! A Jew marrying a non-Jew is wrong, and I don't mind feeling disgusted over it. But I do feel bad when I get irked over a mismatch in looks or social strata. I can be so shallow. 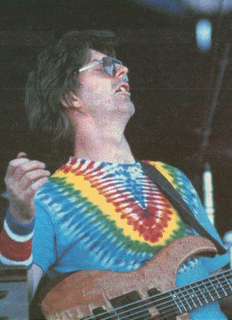 Phil Lesh, bassist for the Grateful Dead, re-grouped musically after Jerry died. He plays with an ensemble of musicians called "Phil and Friends." I have wanted to see them forever, but they haven't played locally. Well, now they will! And guess when? One week after my due date! Yaakov bought tickets. I feel like they're a guarantee I'll have the baby before the show. A jinx, I say! This is the only time in any of my pregnancies that I've actually wanted to be overdue. C'mon G-d - don't I deserve to see Phil? My brother and I are very close. He's awesome. But I have to admit I'm a little jealous of him. Just a little. His father - my stepfather - died when he was 5. I was 14. I always felt our mother took care of him in ways that she never did for me. When he was older, she always bought him clothes and things. She paid for his car insurance, and his rent while he was in college. He was in an accident recently, and his car got wrecked. When the summer ends, she'll give him her old car and get another one. And here's what drives me crazy: he's moving back in with her, and she keeps "complaining" how she's going to have to start cooking again. She's secretly CROWING over being able to coddle her 21 year old baby again! She never did that for me! It's not only the fact that I feel he's favored. He always had his act together, too. We're both fairly intelligent, but I never had the drive to succeed. I was very lazy (still a marked trait of mine). He, on the other hand, worked hard and got good grades. I - regrettably - dropped out of college. He graduated last week. He's considering law school now. He always had a strong social circle, whereas I didn't fit in. He was always doing things with his friends, travelling and going to concerts. This summer he's going to Israel (again), and then has a job as a chaperone for a 3-week teen tour out west. I'd probably try to be more like him. Last night's session focused on empathy. Instead of the normal sequence of child's mistake > parents' anger > punishment, it is changed to child's mistake > parents' empathy > consequence. The empathy is triggered with a phrase: "uh oh." In the video we were shown, the instructor said "uh oh!" in a sing-song voice. When you are upset with your kid for doing the wrong thing, it's pretty hard to stay that way when you sing "uh oh!" After awhile, saying "uh-oh!" will immediately pull the parent into an empathic response (like Pavlov and his bell). The child might need a time-out. If they tantrum when they get there, the parent says; "When you're ready to be sweet, you can come out." The child has to calm down, and then the parent sets a timer for 3 minutes or so. If the child starts to freak out again, the timer is re-set. When they come out of time-out, they get a hug. There is no explaining of why they got there, or any conversation. This is an interesting point, as I always talk to my kids after time-outs. I want to make sure they understand why they went there in the first place! But this approach is for much less verbal interaction. L & L relies on the kid being intelligent enough to get the point. In fact, an example was given that a kid asked why he got a certain consequence. The parent warmly responded; "if you haven't figured it out by monday, come back and talk to me!" Another thing mentioned was that kids get nuts because they are testing boundaries. Once they see that a parent is firm in their limits, they'll calm down more quickly. For some kids, they know that hitting is their parents' limit. Once the parent hits them, they know the anger has dissipated and it's over. Obviously, this is not the appropriate response according to L & L. The child knows when the parent gives a logical consequence, the parent will follow through! So it was an interesting session. The only bad part was the fact that I was very uncomfortable for sitting for so long, and I kept shifting in my chair. At one point, the vinyl on the chair made a noise that sounded like a giant fart. You can just imagine my horror. Of course, I had to shift around to make the chair produce the same noise again, to convince the L & L instructor that it wasn't me. I have to say it feels good to be out of the "pregnancy closet." It's been such a major part of my life, it was weird not to blog about it. Now that I'm in my 9th month, I'm facing major anxiety issues. I mean, I have anxiety in general - I am the Anxiety Maven, after all - but it seems more amplified these days. I don't know if that's due to the pregnancy or what. I was reflecting about my shabbos nail biting session, and I realized that I did the same thing towards the end of my last 2 pregnancies. I remember thinking; "Please Hashem, let my fingernails heal so I don't meet my new baby covered in band-aids." I'm sure the nail biting is anxiety-related. Another issue is labor support: I want Yaakov to come, but who's going to watch our kids? I asked Mrs. Stein to come, but she has to be able to get a babysitter for her kids. My mom asked if she could be with me, but I feel like I don't want her there. I love my mom and we get along great, but she's not familiar with the natural childbirth scene. I feel I'll be inhibited if she's around, and that's not helpful! I know she really wants to be there, and I feel like she'll be let down if she can't attend. Then there's the anxiety surrounding the actual labor. Yaakov has a saying; "insanity is when we do the same thing over and over again, but keep expecting different results." So I'm wondering if I'm insane! I keep expecting the next one to be the magical birth! Yaakov was in the delivery room with me when I gave birth to Srulik, saying tehillim behind a screen. He told me afterwards that he literally wanted to die hearing me in so much pain. I have an appointment with my midwife tomorrow night for a breathing and relaxation class. She's mentioned things/techniques to me that none of my other midwives have. Things that will help me in labor, things that will ease the pushing phase. So I should at least TRY and be optimistic about things, right? We're expecting another kid - in about a month, B'ezras Hashem. Since today is Lag B'Omer - a most auspicious day - I decided to finally share the news. There have been many times I've wanted to blog about it. Like when I was in my first trimester after Hurricane Wilma, nauseous in my hot house with no power for 15 days. And when I had major insurance hassles trying to secure a midwife. I'm still having them. Or when I had the concussion - and lived with a non-stop headache for a week - because I try not to medicate during pregnancy. When a midwifery student, trying to draw blood, failed. Twice. When my primary care physician wouldn't help me when I had pink-eye, because "I don't treat pregnant women." Or when Srulik - during my 6th month - jumped from the top of the couch right onto my big belly. I cried. A lot. I called my midwife. On shabbos. And when my dad spoke to a Chinese astrologer and was told; "She's definitely having a BOY!" When I got a message from the frum maternity store that: "an anonymous friend who really loves you" left me a 100.00 gift certificate. When I was on my hands and knees, cleaning for pesach, 7 1/2 months pregnant. And all of my fun visits to the midwife, Srulik and Rivky in tow. Srulik is in total awe of the Doppler machine. Or how - at my last trip to the pediatrician - the only stickers they had left for the kids said, "I have a new baby brother!" And the fact that this pregnancy has been one giant acne crisis. So now you know. B'sha'ah Tova. So I was lying groggily on the couch this afternoon when the phone rang. Chaya answered and brought it to me. "Mrs. Maven? I'm Officer So-and-So calling you from the state highway patrol. I'm letting you know this call is being monitored for your protection." My heart started beating fast. I mean, what would you think if you heard that? What would be your first thought? Mine was, "UH OH." I wanted to tell him exactly where he could stick the decal. "My husband is the one who handles the finances in our house (huge lie). You'll have to speak with him, and he's not available right now." "You can pledge 10 dollars to the such-and-such fund and we can speak with him later about the rest." "No, I'm sorry, you'll really need to speak with him." Click. Let me introduce you to two mothers in my life, both discovered in Park Slope, Brooklyn. This first mother is timeless. I found her at the 7th Avenue sunday flea market. 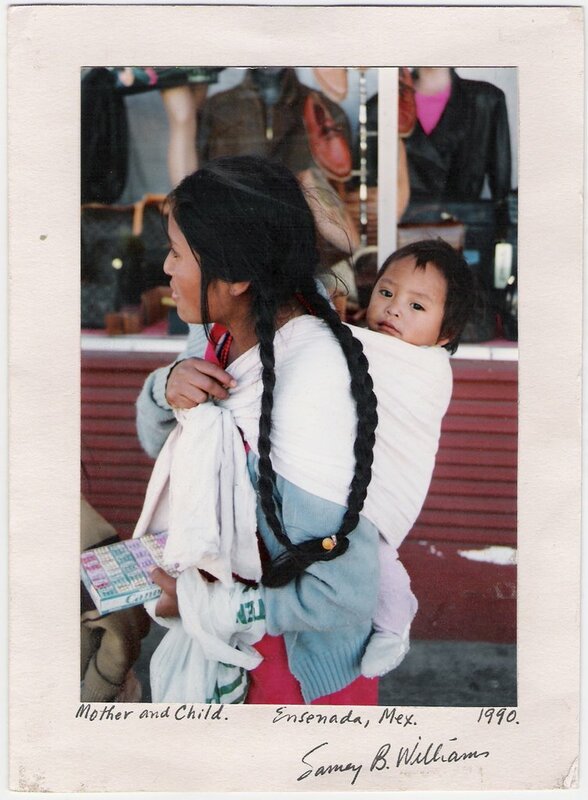 While shuffling through pictures at an antique vendor, her full lips and plump baby appeared. I remember feeling arrested, and I picked her up for a closer look. 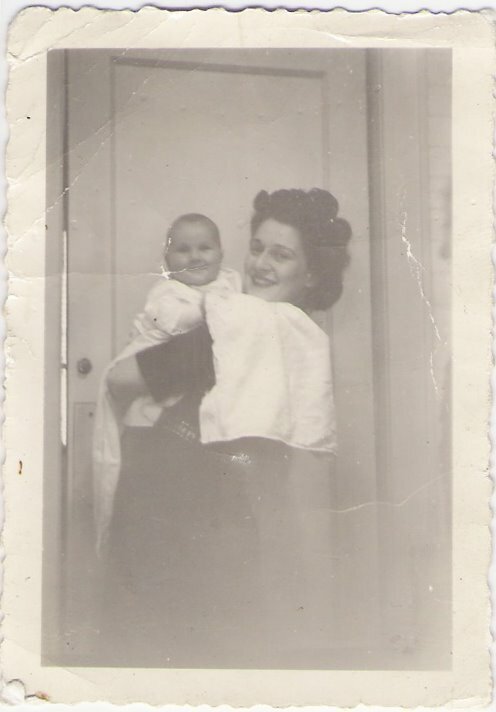 I love her dark, upswept hair and happy face, she seems so proud of her round-faced babe. To me, she epitomizes young motherhood in all its glory. 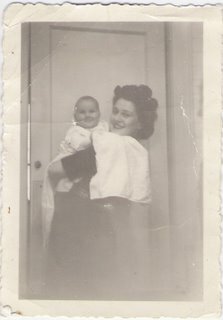 It happens that it was a mother's day when I found her, and for 25 cents I could not leave her behind. I wonder about her, who she was (is?) and who that baby grew up to be. The second mother I found in front of the 7th Avenue Key Foods. The photographer himself was selling his work. I saw this beautiful brown woman, and I loved her instantly. 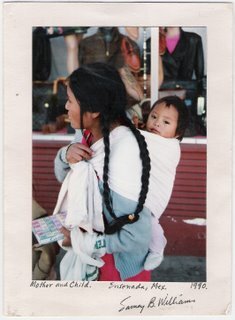 I love her long black braids, draped over her shoulder, son securely on her back. Notice his watchful eyes and his "footie" pajamas sticking out of the sling. To me, he says, "Yo tengo mi madre, y soy contento." I had a terribly stressful day on Friday. I turned that stress inward, after my kids were in bed on Friday night. I started picking my thumbnail. This is forbidden on shabbos. I can be very obsessive-compulsive, and picking at my nails is one compulsive habit I have. Mind you, I don't do it often - but when I do, I really go to town. I call it "getting into a pick." So I'm picking away, all the while saying in my head, "You're not allowed to do this on shabbos, stop it." I imagined Yaakov - safely ensconced in shul - shaking his head at me. I thought, "Why don't I just go drive my car around the block?" That's forbidden on shabbos too. If I let myself do one thing, why not another? And then there's the fact that I called Rav Plony Friday afternoon, asking about covering the cholent pot with a piece of foil before shabbos. I wanted to protect it, as we have a termite problem. Rav Plony said I could loosely cover it. The paradox is evident: I call Rav Plony to observe shabbos properly, then sit on the couch and mutilate my thumb. Yaakov came home. I told him I got into a pick. He asked me if I was serving bacon for shabbos dinner. Isn't he nice? Shabbos morning Chaya went to braid Rivky's hair. I told her this was forbidden on shabbos, then looked guiltily at my thumb. There is a concept called "ruach shtuss," - a spirit of folly. The only way a Jew can sin is if this spirit of folly enters him, blinding him to the fact that he's diminishing his connection to G-d. Even though I told myself I was doing something wrong, I must not have realized that on a soul-level. There's a part of me that feels like a raging hypocrite. Another part feels like this is a normal part of being Jewish. Tonight starts pesach sheini, "the second pesach." In the times of the beis hamikdash - the great temple - people would bring their pesach sacrifices on the 14th of nissan. Sometimes they couldn't make it. They were too far away, or ritually impure, or for whatever reason. The 14th of iyar, one month later, was the appointed time for all those who missed the first offering. We commemorate pesach sheini by eating some matzo. I jokingly told Yaakov that we should tape up a piece of aluminum foil in the kitchen. A deeper meaning of pesach sheni is that there's always a second chance. There's always an opportunity for tikkun and teshuva. M.D. does NOT mean Minor Deity! My rash is almost gone. The one the dermatologist (who did a scraping) said was contact dermatitis. The one the Wednesday-pediatrician said was scabies. I've been treating it with the cream the dermatologist gave me. The pediatrician told me he saw rashes like that all the time, and he considered it scabies. "I can't do a skin scrape on every kid I see - I just give them the scabies medicine." This made me think. A lot. The only definitive way to determine scabies is to do the scrape and examine it under a microscope. If you're not scraping, you can't know for sure. And considering how much my rash resembled a scabies rash, I see how easily it could be mis-diagnosed. So maybe there are kids with contact dermatitis being treated with scabicide? That's bad news! There's a part of me that wants to call that pediatrician and say; "You know, the rash you insisted was scabies wasn't. Maybe you should start scraping your patients to know for sure." But I don't think he'd appreciate that. One of you commented once (anonymously) that I should look into the "Love and Logic" approach regarding child-rearing. There was a L & L workshop given at Chaya's school a few months ago. The speaker was a Lubavitcher therapist, who is also a trained L & L instructor. I was really impressed with the workshop, and with him as a speaker. His wife and I - funnily enough - used to be roomates in yeshiva. I knew he did private L & L consultations, so I called him and signed on for a 6 week private program. He came to my home Monday night for the first time and met with Yaakov and I. He is familiar with the "spirited child" model, and I told him - Baruch Hashem - my kids are all spirited to the max! One thing he affirmed is that spirited children crave empowerment. They want control. Sometimes disciplining the spirited child can be extra-challenging. So he gave us a great tool: offer choices for everything. "Would you like the red bowl or the white bowl?" "Would you like to wear the green skirt or the blue one?" "Would you like to hop to the car or skip to the car?" This way, we are filling their "control bank," and making them feel empowered (often!) throughout the day. Then, when we need to set firm boundaries, the child will be more compliant because her control needs have been so frequently satisfied. What a good idea! I look forward to sharing more parenting tips with you as our sessions continue. Walgreen's: NOT America's #1 pharmacy! Let me rant and rave about how much I hate Walgreen's. I know, "hate" is a pretty strong word. But that about sums it up right now. I filled Chaya's antibiotic prescription last Sunday. When Srulik was diagnosed with strep, the doctor called a script in on Wednesday. When I called Wednesday night, they had no record of the doctor calling. This wouldn't be so bad if they hadn't dropped my calls constantly. At one point I waited for 20 MINUTES! Finally somebody picked up, and then hung up! GRRR! Since they had no record of the doctor's call (even though I was standing right next to him when he made it), I took the prescription to CVS pharmacy. Here's the silver lining in this whole story, discovering CVS (insert heavenly choir music). They have a drive-through pharmacy window! What a lifesaver for a busy mother! How pathetically grateful I was to not have to take Srulik and Rivky out of the car! I drove through, ran another errand, and picked it right up. No hassle. Two days later, Walgreen's called telling me they had Srulik's prescription ready. Oh you do? Oh, I was told the doctor didn't call you. I took the prescription somewhere else already. And to top it off, Chaya's antibiotic prescription (from Walgreen's) is missing liquid. She's about 5 doses short. I know sometimes antibiotics are half a dose, maybe one dose short - but 5? I called Walgreen's customer service today, and really went nuts on them. I told them the whole megilla (I should have added that I had to sit through 5th Dimension's "Age of Aquarius" while on hold). They assured me they would take care of the additional doses that Chaya needed. "Don't worry, Mrs. Maven, someone will contact you from your local store today and you can pick it right up." Well, you know the ending to this story. Nobody called me. I called the pharmacy and went through the whole rigamarole of nobody picking up, yada yada. I finally got the pharmacist on the phone. You know what he had the chutzpah to say? "How do I know what happened with your daughter's prescription?" I wanted to scream. What the hell do you think I did with it - poured it down the drain? Sold it on the corner? (The street value of amoxicillin is very high these days.) You didn't give me enough, Mr. Jerk, that's what happened! I hate you! I hate your lousy store! I'm never coming back! Well, that's not quite true. I have to go back tomorrow and talk to the pharmacy manager. With Srulik. With Rivky. I hope they wreck everything in sight. The Amish are on to something. One of Yaakov's pet topics is peak oil. For those not familiar, it's the fact that there's a limited supply of global oil resources. Yaakov has been following this for a couple of years already. I started thinking about this on Friday, as I sat in the carpool line at school. Practically every single car was a mini-van or other large size gas-guzzler (mine included). I thought to myself, "Man, this carpool line alone is sucking up the world's oil supply!" I don't know when G-d is gonna shut the valve - but I do know that I'm not ready! You know who is? The AMISH! They don't depend on oil, nope. They grow their own produce and live in their non-electrified homes. They're happily driving their buggies, being self-sufficient. When the world collapses in chaos over natural resources, Amos is gonna be sipping lemonade in his cabbage field. 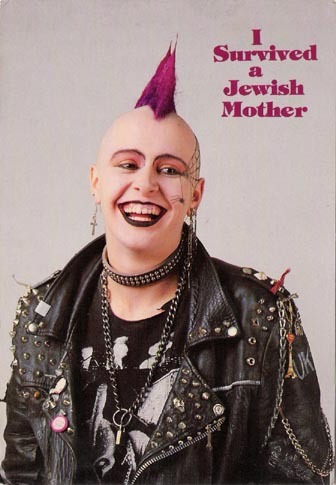 There's an old yiddish saying; "Men tracht un Got lacht" - Men plan and G-d laughs. There's a rich addendum; "and chassidim laugh along." Well, the Amish are gonna be laughing over this one. Allow me to share all my doctor's office drama. Let's start with the scabies fiasco. A friend of mine in the neighborhood had it, and then I noticed a rash on my arm. Considering I had hung around my friend lately, I thought I would get it checked. It happened I had to go to the doctor for Chaya on Sunday, so I asked the pediatrician what he thought of the rash. He didn't think it was scabies, but he advised me to go to a dermatologist. (Chaya had strep, by the way). I went to the dermatologist on Monday, and I saw an old friend of my mother's there. She said he was a great doctor, she'd been using him for years. Then she leaned over and whispered, "And you don't have to worry about him looking at your body, he's gay." I wondered how she knew that. I figured if she'd been a patient for so long, maybe he told her? So I'm waiting in the exam room for the doctor, looking at all the scary botox brochures. In walks Dr. Gay. Two big diamond studs in each ear and gelled, spikey blonde hair. This is the dermatologist? He was awesome. He was funny. He was professional. A little queeny, but really great. And he took the time to talk to me, something doctors just don't seem to do these days. He did a skin scrape and examined it under a microscope. It wasn't scabies. Contact dermatitis. He gave me cream for it. It still itches like hell. Today, I went to the doctor for Srulik. He tested positive for strep, too. Let me tell you, my kids were totally bonkers in that office. Touching everything. EVERYTHING! Srulik was opening and closing a drawer in the exam room and the whole face of the drawer came off. I had to let them run through the corridors so they wouldn't wreck the room anymore. One nurse told me she had never seen kids with so much energy, which made me feel a little sorry for myself. The pediatrician who saw us today said I had scabies. I said I didn't, I went to the dermatologist who did a scraping. The pediatrician told me to go back and get re-tested. ARRRRGHHHHHHHH!!! The Sunday-pediatrician said no. The dermatologist said no. The Wednesday-pediatrician said yes. WHAT THE HELL? And another problem: The videos at the pediatrician's office. Today was Tarzan, a Disney cartoon. It was mamesh obscene! This buff jungle man running around in a loincloth? This is okay for children? Not to mention two almost-kiss scenes with scantily-clad Jane. I was fuming! I kept wanting to ask the front desk people to turn it off, but I didn't know how to tell them. "Um, hello, your Disney video is too racy for my children." I wasn't assertive enough, is what the real problem was. At one point there was a pirate scene. They were fighting, and one of the pirates put a double-barreled shotgun up against Tarzan's chin. Again, this is supposed to be for children. I was through. I went to the front desk and said, "I'm sorry, but this video is too violent for my kids." I felt like I couldn't complain about the immodesty - how could they understand that? But violence is another thing. Rivky was standing next to me, crying that she was scared. My proof! They took the video off. Now that I look back at the whole thing, I should have just said "This video is inappropriate for my kids," right from the get-go. I didn't have to explain anything, and they might have turned it off sooner. And the final complaint is the awful service I'm getting from the pharmacy. I'm not even going to go there. I've been on the phone with them for over an hour trying to deal with Srulik's prescription. Last night I had the weirdest dream. I was at a frum wedding, but it was totally unconventional. I was wearing a beautiful bohemian dress, and I had my nose-ring in. I guess I wasn't married because there was this handsome, Jewish college student I was flirting with. He was blonde and clean-shaven, with glasses. I was making all these witty comments and feeling like an attractive, magical woman. And then I spotted her. She was beautiful and polished, with creamy skin and raven hair. She wore a black pea coat and classy shoes. Pearls. She was oozing class. And she started flirting with him, too. That's it, I thought. I'm done. Why would this guy want me when he could have her? I woke up feeling very sad. I remembered the girl I was, feeling inadequate next to all the rich, fashionable girls in high school. I remembered nights alone in my room, listening to Vivaldi and writing in my journal. Everybody else was at a party I wasn't invited to. I remember not fitting in - I didn't really know how. I told a friend my dream, and she said both women were me. The hippie is the part of me that's still rough around the edges. The classy one is who I can be, or aspire to, or perhaps sometimes am. We haven't quite figured out the role of no-beard college man, but somehow he's Yaakov.